I flagged this question and it got declined. 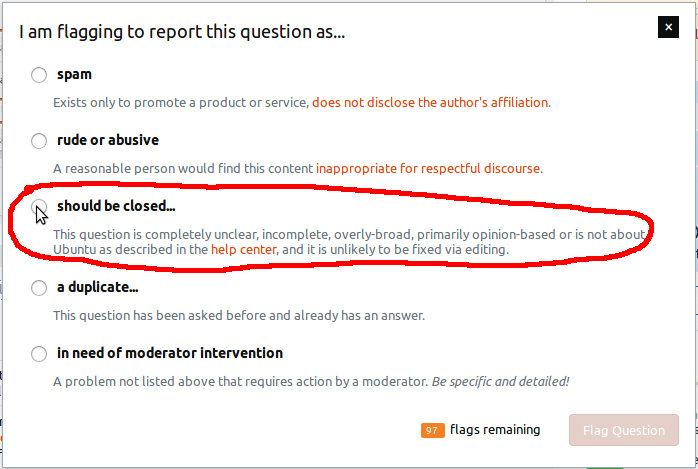 Later on I checked and saw the question was put on hold as I had requested, so this means the mod did not review my flag properly (?) and then maybe someone else flagged this question and then other mods accepted that this is a bad question(? ), anyhow, my flag is still shown as declined. Shouldn't my flag count as helpful since it was helpful at the end of the day? Your comment clarifies that your goal was to raise a flag that indicated the question should be closed because it was unclear. You can flag a post as unclear what you're asking. But because it is a close reason, you must do it by clicking the should be closed... option. You should only do this when the question does actually qualify for closure--not if it's less than ideally clear but can still be understood, and not if you can just fix it by editing. But questions do often qualify to be closed as unclear, and the question you found and flagged was such a question. When you flag a question, you won't always see those exact options. For example, sometimes the system lets you cast a very low quality flag. Even when it does, you should not actually use that flag except in the unusual situations described by Thomas Ward here and by terdon there. But whatever other options it shows you, if the question is still open (and not currently locked by a moderator) then it will always let you select should be closed.... When you do it will show you another dialog box with the various close reasons you can select, one of which is unclear what you're asking. Screen capture contributed by Bhargav Rao. Before (or just instead of) reading this section, I recommend everyone read the "2. Very Low Quality (VLQ)" section of that post, which Thomas Ward's answer cites. The examples I am about to give are unofficial and possibly wrong (hopefully I'll get feedback if so), while as far as I know the guidelines about VLQ flags have not changed since that answer was posted. The core point about VLQ is that it is for posts that appear totally unsalvageable, such that it might even be reasonable for you to delete them immediately, if you had that power. I believe these are examples of the sort of questions that are considered reasonable to flag as very low quality. Note that these are not real questions that have been asked on the site... though they are inspired by actual posts that I have seen from time to time. I mean, huh? I can't know. Note that it would also be fine just vote or flag for closure: the first two are unclear and the third is off-topic. ff browser no start nothing no problems before then addon install someone says use sudo but how? How! I would immediately downvote such a question and I would vote to close it as unclear, but I would think twice before flagging it VLQ. This is because it is possible (though painful) to discern from it that (a) the OP installed an add-on or extension, then (b) Firefox would no longer start, possibly as a result of that, and (c) they think they are supposed to do something with sudo to fix it. If I saw that post, I would probably try to edit it, too -- at least to rewrite the title and remove the third paragraph! -- even though my edit would not be able to fix the absence of essential information and would not, in such a case, be an alternative to voting to close. If I had time, I would improve the question's grammar and reword it, and comment to mention that running Firefox as root would probably not help, and perhaps also to suggest specific troubleshooting steps. Though pretty darn low in quality, that last question clearly is an attempt to describe a specific problem and it could be improved (after which time voters could remove their downvotes and reviewers could consider reopening it). 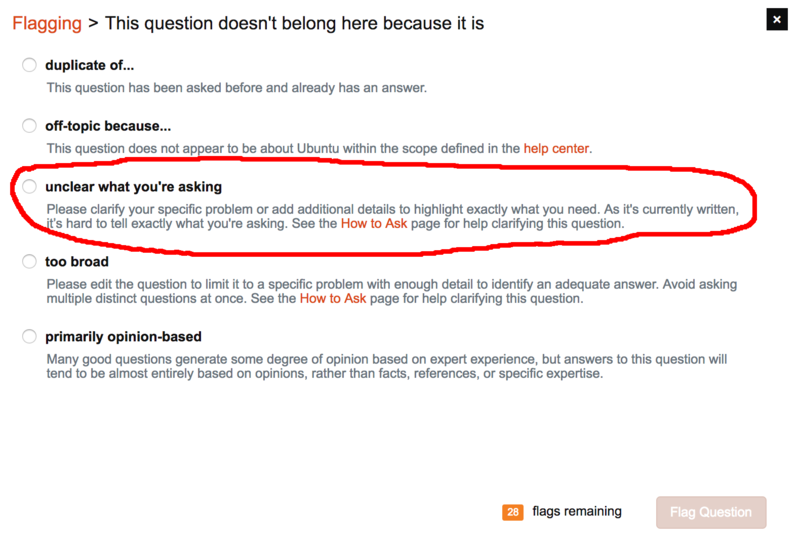 In contrast, for the three questions shown above, it would be hard even to give specific advice about how the OP should improve their question. Compared to all those examples above--even the last example which is borderline but probably not VLQ--the question you encountered is a breath of fresh air! Its problem is simply that it does not provide enough information to be answered. It was rightly closed, but improvement is surely possible, and commenters have requested specific information based on what it did say. It will likely be reopened and answered if the OP gives that information. Flagging as very low quality should be limited to posts where the problem is both severe and extremely unlikely ever to be fixed. Your flag was a "Very Low Quality" flag. Not an "Unclear what you're asking flag". I, for one, judge VLQ flags with the harshest scrutiny: "Is the question able to be salvaged or to be better understood, regardless of whether the core question being asked is unclear or not?". Since I handled your flag, this is the judgement criteria for VLQ flags I use, and is what I applied here. The question is unclear what is being asked, but what was written could be written to be less 'low quality'. It would still be unclear, but it does not fit into the "unsalvageable crap" category that VLQ includes. All things aside, the post could have been salvaged to make the post readable though it would still be 'unclear'. "Unclear what you are asking", yes. "Very low quality", no. I would recommend that you review the guidelines of How to Flag Correctly which exists here on Meta to get an idea of what we actually expect with different types of flags. VLQ is not what that post was. Why was my off-topic flag declined?